Europeans are making a conscious effort to boost their savings. 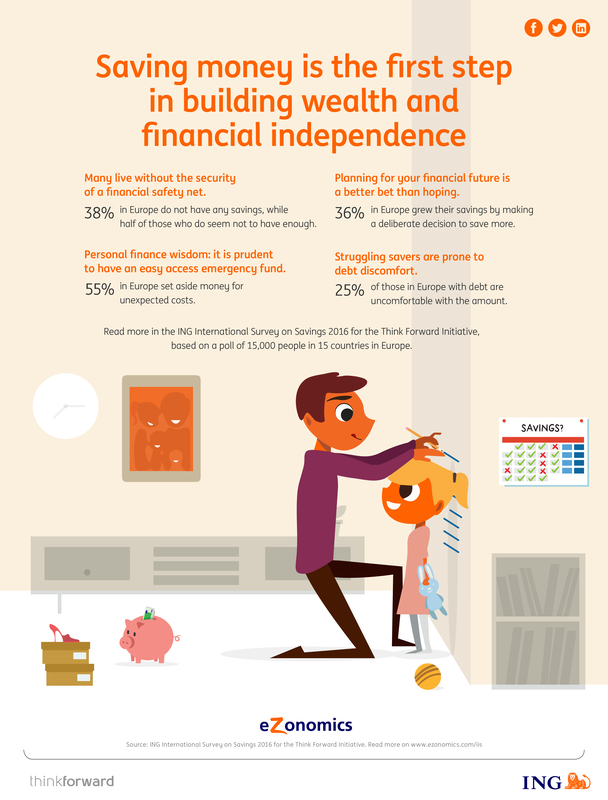 The ING International Survey on Savings 2016, which surveyed almost 15,000 people across 15 countries, reveals one in five (19%) people in Europe grew their savings over the last 12 months, with the UK and Luxembourg having the largest share putting money away (30%). However, the source of this growth is not because people have more money. In fact, over a third (36%) of savers in Europe are making a deliberate decision to save more, despite not earning more. Instead, people say they are cutting back on spending on non-essential items, such as clothing and grooming (9%) holidays (12%) and leisure and entertainment (15%) in order to boost their funds. Conversely, net spending on essentials such as utilities (33%), food (17%) and heath (13%) saw significant increases across the continent. The study found that only a quarter (26%) of people in Europe are comfortable with the amount they have available in savings. Illustrating this, just under half (49%) of people in Europe have enough savings in place to cover three to six months of take-home pay - the widely recommended buffer level. And less than half (45%) do not have enough to cope with an emergency such as the car or home heating breaking down. Interestingly, the countries most comfortable with their savings are those where people have increased the amount they save, and vice versa - for example, consumers in the Netherlands (43%), Luxembourg (40%) and the United Kingdom (39%). Conversely, consumers in Romania (19%), Italy (17%) and Poland (12%) were the least comfortable with the amount they have saved, and fell to the bottom of the table when it came to growing their savings over the last year (see Table 1). Many may also realise how fragile finances can be – with over a third (36%) of those whose savings declined in the past year citing ‘unexpected expenses’ as a key reason.